Have you been seeing burgundy and white ribbons around more often? A lot of them can be randomly spotted tied around tree trunks at the park or bumper stickers on the backs of people’s cars. It’s because dentists and citizens alike are trying to spread awareness of a dark reality that tends to be overlooked: oral cancer. According to the Oral Cancer Foundation, approximately 49,750 patients will be diagnosed with oral cancer in 2017, probably causing about 9, 750 deaths. That’s roughly 1 death per hour, 24 hours a day! April is National Oral Cancer Awareness month and it’s important that patients know how to prevent themselves and their loved ones from it. Your Columbia dentist is here to inform you about high-risk factors, symptoms, and how visiting Columbia Healthy Smiles for checkups, cleanings, and oral cancer screenings can help prevent your family from ever suffering from this deadly disease. Are you risking your oral health? Did you know that 1 in 5 people smoke tobacco products? Believe it or not, tobacco accounts for two in every three oral cancer cases! There are thousands of chemicals contained in a single cigarette and they are entering your body through our mouth. There is still time to change your smoking habits, reducing your risk for oral cancer by a whole third. Just because you don’t smoke tobacco, doesn’t mean you’re not still taking the toxins in your body. Chewing tobacco directly effects your mouth because you absorb the chemicals through your gums. Also, if you’re exposing your family members to second-hand smoke, you’re increasing their chances of developing cancer as well. Drinking large amounts of alcohol is another major risk factor. Moderation is key with alcohol consumption for not just your oral health, but your overall health. The risk of contracting oral cancer is increased by a third for excessive alcohol consumers. If you are a mixed consumer, meaning you smoke and drink excessively, you are increasing your risk for oral cancer by up to 30 times! It is especially important to visit your family dentist in Columbia to receive regular (or more frequent) oral cancer screenings if you continue or have participated in these risky habits. Other factors such as viral infections, autoimmune deficiencies like HIV, and diabetes may also take a toll on your oral health, leading to an oral cancer diagnosis. When’s the last time you had a checkup and oral cancer screening? As you read the list of symptoms, did you start to get worried? Normally cancer isn’t a subject that is normally discussed. It can be easy to ignore the tell-tale signs or be unaware to how you’re putting yourself at risk. Just because you were living in bliss doesn’t mean that oral cancer is any less dangerous. 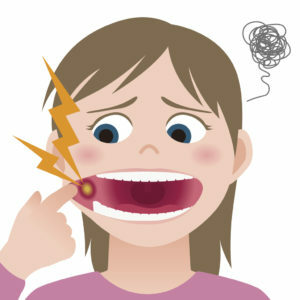 That’s why our dentists believe in expressing the important of awareness in April. Our team takes this threat seriously, and we can provide screenings as a vital part of your regular checkup. Dr. Batson will thoroughly review your oral tissues, head, and neck area for symptoms that you may not be able to see. If our team notices anything suspicious, we can discuss moving forward with a biopsy to get you a concrete diagnosis. Contact Columbia Healthy Smiles today to be proactive in your long-term health!